CADS Grand Prize Draw & campaign update. Saturday 18th November 2017, 7pm at The Croust House, Roskilly’s Farm. The cheese and wine evening will start at 7pm and will include an update on the CADS campaign, tidal lagoons and Dean Quarry, as well as the draw for the raffle prizes. To help us manage numbers, please email info@cads2015.com by 5th November if you would like to attend. Raffle tickets will remain on sale at Roskilly’s, St Keverne Newsagent, Coverack Village Stores, Fat Apples Café and Gillian’s Larder until 3rd November. Visit cads2015.com/raffle for a full list of prizes and to purchase raffle tickets online. Additionally, there are daily posting on Facebook and Twitter, where our supporters can more fully engage in the progress of our campaign. If you would like to make a donation, please go to our How to donate to CADS page or follow the Paypal link below. If you would like to buy tickets online for our 2017 Grand Prize Draw then simply click here. 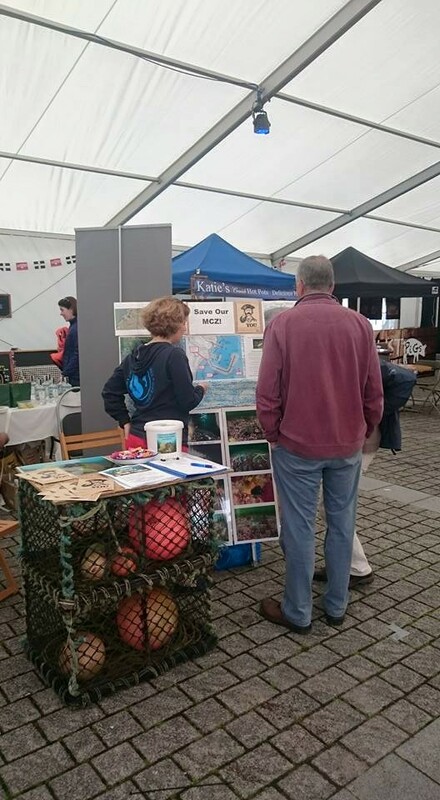 Great three day event with CADS2015 stand in a prominent position and well attended by members of the public talking about our campaign, the Marine Conservation Zone, making donations and signing up for future newsletters. More events like these are planned in the near future to help get the message out to the general public both locally and nationally. It was amazing to hear the response from visitors to our area, particularly those who come back every year or visit for the specific purpose of diving in the Marine Conservation Zone. Plenty of offers of help in all areas. Feeling very supported in our campaign.